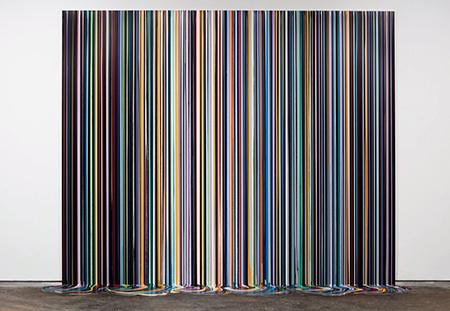 Ian Davenport is closely associated with the Young British Artists (YBA’s) in the UK, and was a 1991 nominee for the prestigious Turner prize, quite early in his career. His abstract paintings are firmly rooted in post-conceptual art practices that privilege an investigation into materials and a process of art-making firmly at odds with traditional art practice. This large-scale exhibition brings together several bodies of work that provide a comprehensive view into Davenport’s gravity-based, counterintuitive if not quite revolutionary technique. This signature and very well-mastered drip method was used to realize multicolored stripe paintings normally associated with tape and carefully brushed paint application. These stripe paintings have been compared to the work of Bridget Riley due to their playful optical quality. Referred to as the “Poured Lines” series, these visually compelling large-scale pieces often feature pooled volumes of paint that, executed on site, run off of the surface and onto the gallery floor as a contrast that disrupts the rhythm above. The ensuing entropic disorder redefines the space and underscores the materiality of the paint itself. In the reflective and minimal “Poured Paintings (Arches),” Davenport uses household gloss paint over medium density fiberboard to investigate fields of color bounded by lines that clearly delineate volume. You can see your reflection in the surface as well as the gallery space, and therefore other paintings behind you. In the “Untitled Circle Paintings,” blue and pale grey circles on an off grid are superimposed over a black surface, producing a sobering and calm counterpoint in an exhibition otherwise full of enticing and energetic works.